Mourning the loss of their 5-day-old son due to birth complications, the Healys took to social media and appealed for assistance. The Healys created a gofundme site to share their story. Five days after he was born, and one day after Christmas, Islander Clayton Jerome Healy died on Dec. 26 due to complications suffered during his birth, following an emergency cesarean section that inhibited his supply of oxygen. On the recommendation of family and friends, his distraught parents, Joseph “J.J.” and Morningstar Healy of West Tisbury, turned to GoFundMe, a crowdsourcing website page, to appeal for donations to cover medical and funeral costs. The initial fundraising goal was $5,000. In a single day, the immediate and extended Island community pledged a total of $21,775. As of Tuesday afternoon, 339 people had sent the Healys donations, totalling $23,005, and the page had been shared 824 times. Friends set up the page with the couple’s permission. It included a description of what happened during birth, and asked for help and prayers. Within an hour, Mr. Healy told The Times in a telephone conversation Tuesday, they had received $2,500. The couple said they were floored. “Money was tight, or going to be tight, and we all of a sudden got struck with funeral costs and everything like that,” Ms. Healy said. Ms. Healy is a nurse at Martha’s Vineyard Hospital, where she works in the acute-care unit. She has lived on the Island all her life. Mr. Healy, who moved to the Island 11 years ago, works for Vineyard Engineering. They have been married four years. They credit the tight-knit Island community for the outpouring of generosity. Both were taken aback as the donations continued to flood in. The outpouring has helped them to get through an emotionally turbulent time. “It’s really what has kept our spirits up,” Ms. Healy said. Mr. Healy echoed his wife’s sentiments. Nancy Nevin of Vineyard Haven told The Times her daughter Morningstar’s recovery has been “amazing.” She credited her daughter’s job at the Martha’s Vineyard Hospital for her support network. “She’s touched many, many people,” Ms. Nevin said. Donations have ranged from $5 to $500. Donors include families and individuals. Many have posted comments. Many messages echoed what the Healys said about the close knit Island community. “Know that you are surrounded by love and compassion, and an Island full of folks who are holding you in their hearts,” wrote Dawn Warner, who made a $50 donation. Donors Helen and Barbara Koch recalled the impact that the Healys and their families have had on Vineyarders. “Morningstar was one of my mother’s nurses on one of the last days of her life. My Mother loved the beauty of her name. I am sure – up there with many others – my blessed mother is with their friends and family – holding him – and surrounding him with love,” said Helen and Barbara Koch. 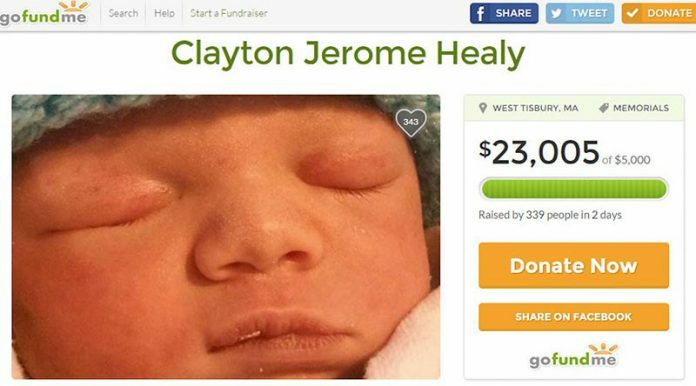 Ms. Healy went into labor two weeks early, but because Clayton was estimated to weigh more than six pounds, he was expected to be fine, Mr. Healy wrote on the fundraising page. However, the situation grew dire when doctors at Martha’s Vineyard Hospital realized that he had gone without oxygen for a period of time. They performed an emergency cesarean section, and Clayton was medflighted to Massachusetts General Hospital (MGH) in Boston. He was put in the newborn intensive-care unit, where he was kept in a controlled state of hypothermia to halt any additional brain damage that might have resulted due to the lack of oxygen during birth. He was kept in that state for 71 hours and then slowly warmed over the course of another 12, after which doctors assessed the extent of the damage. Until Ms. Healy went into labor, the pregnancy had been healthy and normal. The difficulties were unexpected. Mr. Healy wrote at the time that doctors were very upfront about the grim prognosis. The day after Christmas, Clayton died at 4:32 pm. A graveside service is scheduled at 11:30 am, Thursday, Dec. 31, in the Oak Grove Cemetery on State Road in Vineyard Haven. A reception will be held at the New Ag Hall in West Tisbury from 12:30 to 3:30 pm. Donations in Clayton’s memory may be made to Make a Wish Foundation America; Gift Processing; 4742 North 24th Street, Suite 400; Phoenix, AZ 85016, or wish.org/Donate.